TechSmith Morae is a very powerful usability software which is also one of the leading tools in the market. It give you the ability to view and record user interactions, analyze what you record and share your insights with anyone. The tool provides you with hard data and undeniable examples of usability problems. It also automatically calculates and graphs effectiveness, efficiency, and satisfaction. Due to its pluggable interface, Morae can be highly customized for features specific to your working environment. Founded in 1987, TechSmith Corporation provides practical business and academic software products that can dramatically change how people communicate and collaborate. TechSmith enables users to work more effectively wherever they may be, and ensures that the process of creating, sharing and collaborating around content is simple and intuitive so that others can learn from their knowledge. Morae ties what used to involve lots of devices and applications that didn’t talk to each other into one tidy package – eliminating hours of wasted effort. With Morae, all your data is captured digitally and indexed to one master timeline for instant retrieval and analysis. 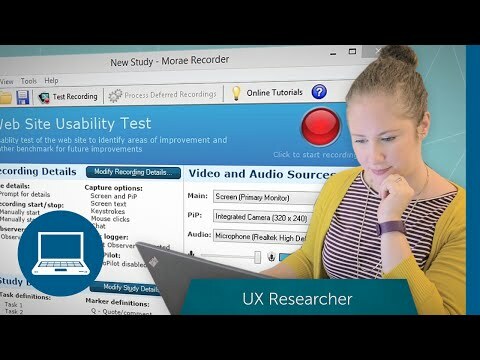 Select a research method from Morae’s preset study templates – focus group, software usability test, or mobile device test – and Morae will set up the initial details for you. It even shows you a live preview of what will be recorded. From there, it's simple to add things like task definitions, discussion questions, surveys, and custom markers. Want to use the same configuration again later? Morae allows you to save and re-use. Make the most of Morae by writing your own Recorder, Observer, and Manager plug-ins. Morae’s pluggable architecture enables you and your development team to build features specific to your testing environment. Learn more about the expanding flexibility of Morae’s pluggable architecture and about the plug-ins that partnering companies have already created on Morae’s Plug-ins Page. Use Morae’s camera-only recording to reach beyond the screen to record customer interactions that don't happen on the computer – like focus groups, in-depth interviews, hardware testing, paper prototype testing, and more. Plug multiple video cameras into your computer for off-screen recording or PIP (Picture-in-picture). You can use consumer-grade digital video (DV) cameras, webcams, or a mix of both. When you're not recording the screen, you can use the recording computer for logging notes too (see system requirements for details).